The Market Hall, museum and library sites in town are all set to reopen to the public this week after being closed for refurbishments. As well as existing traders, there will be new stalls and start-up businesses using the site, which has undergone a £480,000 revamp by owners Harborough District Council. The revamp has included a new layout, food hall, public toilets inside and new signs and entrances. A council spokeman said: “There will be a fantastic number of traders joining the market for the reopening, some new traders and many of Harborough’s established market businesses. It will be open for six days a week, Tuesdays to Saturdays, with the antiques market held on Sundays. The council is now referring to it as Harborough Market rather than the Market Hall. 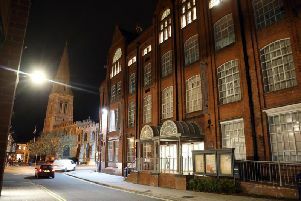 The new integreated Harborough Museum and Harborough Library, which is housed at the district council’s The Symington Building HQ in Adam and Eve Street, is also reopening its doors to the public on Tuesday. The museum has been closed for 15 months for refurbishment and the library has been shut for the past two months after having a stint at Millers House for much of the past year. The museum is reopening under the auspices of a new volunteer-led Harborough Museum Trust. Its interim chairman David Johnson said: “Over the past few weeks I have seen all the fantastic objects from the extensive Harborough collection take their places in the new display cases. “There is so much more to see than ever before; something new to discover on every visit. Meanwhile, the district council has officially opened its new HQ. Dignataries were invited including Harborough MP Sir Edward Garnier. It was an internal, invite-only event.